Our 2008 cycling trip gave us a taste of France. 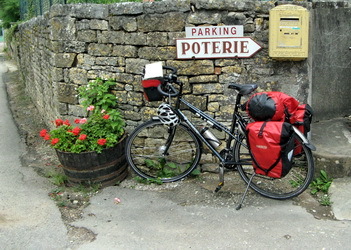 We cycled in Paris, Burgundy, Alsace and Provence. We loved French bakeries and cake shops. This has had some not so good side effects - we came back with extra weight! And that's in spite of cycling over 1000km. If you are planning a similar cycling tour you will find a lot of useful information in our trip Itinerary and day-by-day Trip Report. If you would like to see the beauty of cycling in France do not miss the Best Photos & Videos. You may also be interested in our recommendations for the best places to see, stay and eat in Top 5. If you have any questions or comments please write to us. Enjoy and have a great time on your virtual bicycle tour! This eight day trip around the volcanic region of Auvergne in the centre of France took us through some surprising ladscapes, nice valleys and some challenging passes (at least challenging for us). On our site you will find the description of our itinerary and brief notes on what we saw with some potentially useful tips for housing. From 28 August to 08 September 2008 I surrounded Switzerland. A varied tour of flat country side to hills and Alpine passes. A relaxed trip on the Greek island named Rhodos. I ve actually done quite a number of bike-trips myself. It was always a pleasure to be out in the nowhere for longer period of time just moving forward on two wheels. Finally, after a longer period of absence from travelling I could free two months again. This time the challenge was to find a way of cycling with the entire family, with Juri (4) and Lenya (1), and my wife Angela of course. Thanks to the great Swiss invention of follow-me tandem we could attach Juris bike and de-tach it from time to time if traffic allowed. The bigger challenge was to find enough storage for our luggage which lead to the ``convoi exceptionnell'': two trailers in row behind my bike. If you want so see how that worked out on the way from Zurich to the French Atlantic, read this live-blog written during the tour on my mobile phone (German). There are plenty of pictures of course as well. Nascondo il bagaglio presso il monumento che ricorda l'eccidio nazista di Kalavrita, che è un po' la Sant'Anna di Stazzema del Peloponneso , e per la prima volta mi godo dunque qualche km scarico. A cinque anni esatti di distanza dal 29 agosto 2003 in cui scoprii questa affascinante montagna, mi ritrovo dunque a calcare i 2341 metri del monte Helmos o Aroania , terza vetta della penisola dopo il Taigeto e il Cillene. Quest'ultimo è vicino e ben visibile, con il suo ampio costone sul quale Ercole si sedette a suonare le nacchere di bronzo per scacciare gli uccelli della palude Stimfalia... Quella fatica - la sesta - fu anche l'ultima che l'eroe portò a termine nel «piccolo mondo» del Peloponneso; per le altre sei avrebbe dovuto aprirsi al «grande mondo» - il Mediterraneo e anche oltre - spaziando dal Caucaso, dove si impadroní della cintura di Ippolita, fino là dove il Sole va ogni giorno con il suo cocchio a riposare, sul lontano Atlante marocchino, dove colse i pomi delle Espèridi. Sweden: the Ginstleden and Swedish NSCR routes. Norway: Rallarvegen, Sognefjorden area, Vikøyri Voss. The day started early. Although the campsite itself was quiet, the road next to it had a surprising amount of traffic. Added to this there was someone racing around in the middle of the night on a moped without a silencer. At around seven our neighbours decided to start rooting around their car for something vitally important ('oh my God where is my Thermarest inflatable dialysis machine I need it right now' or something similarly life threatening) and by quarter past, it was clear neither of us was going to get any more sleep. 'Oh well' we thought, 'there is always a shower to look forward to'.....Which in retrospect was another of those things you shouldn't say on cycling holidays. For Vilshäred campsite introduced us to peaceful and neutral Sweden's secret weapon: a variation of Chinese water torture known as 'the one kroner shower'. It was an unforgettable tour of contrasts: from the baking sun in Sweden to the rain and floods in Norway. 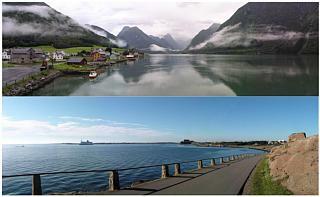 The gorgeous Swedish coast versus the majesty of the Norwegian fjords and glaciers. The travelogue contains pictures, videos and trip statistics per day plus some things we have learned from this tour. An account of a weeks bike trip to the Italian Alps (Bormio), (and a bit of Switzerland) in September 2008. The legend that is the Passo Stelvio had been on my itinerary for a few years. Between us, we'd expanded that to include the equally legendary Mortirolo and Gavia passes, and anything else we'd regard as a bonus! Includes a daily ride report and route maps, plus loads of pictures of each days ride in the gallery section. Cycling from Bassano (Venice) to Vienna. Google maps + gps tracking files included. A seven day cycle trip from Nice in France to Santa Susana on the Costa Brava in Spain, a fabulous cycling adventure of 457 miles mostly keeping right on the coast and including some off road tracks such as the 'digue a la mer' going through the Camargue National Park to the seaside town Saint Marie de la Mer. Wir haben uns in diesem wunderbaren Landstrich fünfzehn Tage lang von dem hier herrschenden Wind voran treiben lassen. Schöne Landschaft, guter Wein und die romanische Kunst geben einen guten Rahmen für eine vergnügliche Fahrt. This was our first tour of the season and we have new bikes. In the Internet we saw a site describing a new bike route connecting Prag and Paris and decided to follow the French section. After cycling from here to the Rhine, we rode through Alsace-Lorraine, the Champagne Region and enter Paris along the Canal de l'Ourcq. We followed river valleys and canals, but still were in for a lot of climbs before we reached our goal. Eine Radreise, die uns von München nach Augsburg, Stuttgart, Karlsruhe, Nancy, Bar le-Duc, und schließlich nach Paris führte. (1050 km). Il primo viaggio interamente in bicicletta, la classica ciclabile del Danubio, 360 km da Passau fino a Vienna costeggiando il fiume, dormendo in bed&breakfast e campeggi. Germany -- bicycle tours of two piciclisti who only have bikes in their mind. We decided to make our honeymoon in Southern Germany at the border to Switzerland, riding our bikes from the Lake Constance (Bodensee) to the Lake Königsee. We did a one-week-tour in August 2007. The cycle route between the lakes sets out from Lindau toward the Allgäu hills. Tiny villages dot the landscape between forests and meadows. Offering a view over the Allgäu Alps, the route goes on to Füssen with its lovely houses. Passing the gorgeous Neuschwanstein Castle, Bad Tölz on the Isar, the route continues through the Upper Bavarian picture-book scenery to Lake Tegernsee and on to Lake Schliersee. The tour?s final destination is right in the heart of the Alpine countryside of the Berchtesgaden National Park: Lake Königssee is truly a crowning finale to a princely cycle tour. A complete blog describing a ride across the Pyrenees from Hendaye on the Atlantic coast to Cerbere on the Mediterranean coast. 4 and a bit days diarised for 11 cyclists and 1 support car. The pain, suffering, cols and route are all described. 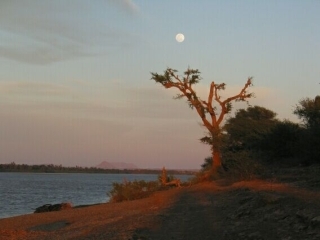 A collection of tours that will eventually link up as a global circumnavigation. Fast riding with little luggage. Cycling from Bassano (Venice) to Zurich, passing Ofenpass, Flüelapass and Albulapass. Google maps + gps tracking files included. Un percorso alla scoperta delle Alpi Orientali che combina in maniera piuttosto equa bicicletta ed escursionismo in montagna. ¡ Mira la bici ! c'est un site entièrement monté avec la pipe et le couteau, consacré au voyage à vélo couché et qui parle de ce premier périple en 2007 à travers l'Espagne entre Toulouse et Gibraltar. Mais ¡ Mira la bici ! ( ``Mate le vélo!'' 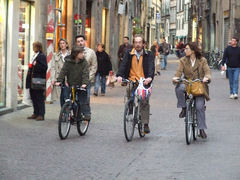 en espagnol) n'est pas seulement le carnet d'un voyage à vélo couché à travers l'Espagne, c'est aussi le point de convergence entre le voyage à faible empreinte environnementale, la photographie et le vélo couché. Et puis parce qu'internet m'a été d'une aide précieuse pour la préparation de mon périple, ces pages vous en diront un peu plus sur ce petit bout de chemin et donnent le maximum d'informations sur ce voyage en particulier, sur le voyage à vélo en général sans oublier deux ou trois mots sur le vélo couché. 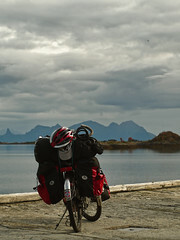 A three month solo tour in Norway and Sweden, starting in Bergen and riding up towards the North Cape and beyond. This is the story of a three-month solo cycle ride around Norway, starting in Bergen, and exploring the Nordland, Troms, and Finnmark counties and a bit of Sweden. 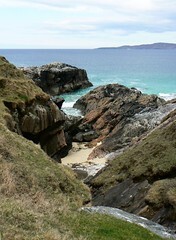 The scenic Atlanterhavsvegen (voted one of the world's best road trips) is also described. Rodadas es un manual para aquellos que quieran iniciarse en el cicloturismo. En esta página encontrarás información sobre cómo elegir tu material, trucos para solucionar algunas de las situaciones con las que se enfrentan habitualmente los cicloviajeros e información sobre iniciativas cicloturistas en España y allende de los mares. Además, te contamos nuestros viajes a través de Europa (en junio-octubre 2005), Escocia (2003) y Holanda (2002).